The Hausbeck Plant Pathology Research Lab presented a poster titled Diagnosing and Managing Phytophthora on Squash at the 2019 Empire State Producers EXPO held January 15 – 19, 2019. 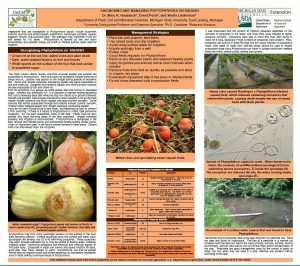 The CucCAP vegetable pathology team used this poster at a series of cucurbit disease workshops presented in Michigan during the months of January, February and March 2019. View or download the poster here. Crop & Disease Management butternut squash, Hausbeck Lab @ MSU, Phytophthora. permalink.